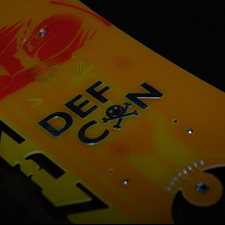 The DEFCON 16 Badge was created for the 2008 edition of DEFCON, the largest and oldest continuously running hacker and computer security convention in the world. 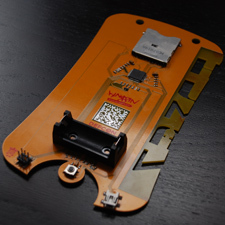 The badge uses active electronics, an artistically-designed circuit board, and provides intentionally “open” circuitry to allow attendees to experiment with and modify the badge to their liking. 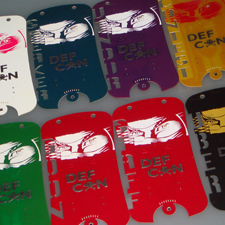 A total of 8,500 badges were manufactured and eight different text cut-outs and soldermask/silkscreen color combinations were used to denote the different DEFCON clientele: Human, Goon, Staff, Press, Speaker, Vendor, Contest Organizer, and Uber (awarded to the winners of official DEFCON contests). Grand Idea Studio once again hosted the DEFCON Badge Hacking Contest to award the most ingenious, obscure, mischievous, or technologically astounding badge modification created during the weekend conference. There were 20 official entries in this year’s contest. The winning entry by the Greek Geeks was a Human Password Generator: A software application on a PC laptop tracked the motion of the badge’s LEDs via a webcam and sent a hash of the motion profile over USB to the badge, which then computed the password based on the motion hash and transferred the result back to the PC. Additional contest information can be found at the official DEFCON 16 Contest Results page.